It will slot below the Stelvio when it enters production. Just as the rumors predicted, Alfa Romeo has unveiled a new concept car at the Geneva Motor Show. Sadly, it isn’t the 8C supercar concept we were hoping for, but a stylish SUV. 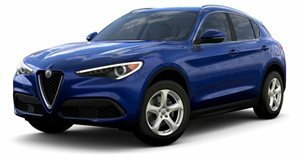 Debuting alongside the Racing Edition variants of the Giulia Quadrifoglio and Stelvio Quadrifoglio is the Tonale, a new concept previewing Alfa Romeo’s first ever compact crossover that will slot below the Stelvio SUV. It’s named after the Tonale Pass in the Alps, which isn’t far from the Stelvio Pass. Take a look at the Tonale, and you may recognize some of its retro-inspired design cues that pay tribute to some of the brand’s most beautiful models. The 21-inch wheels, for example, are a homage to the old-school telephone dial wheels worn by the mid-engined 33 Stradale from the 1960s, while the side profile echoes the Duetto and the Disco Volante Spider. At the front, the headlights are inspired by the designs found on the SZ and Brera, but with a modern twist. At the back, the Tonale concept features wraparound glass, roof spoiler, and full-width taillights to create a sleek design that we hope carries over in the production model. Alfa Romeo says the rear lighting is reminiscent of an artistic signature, rather than an optical lighting element. Inside, the driver-focused interior features a mix of aluminum, leather and Alcantara materials. In terms of tech, there’s a 12.3-inch full digital cluster and a 10.25-inch touchscreen dashboard. The climate vents come with built-in screens, while the LED ambient lighting creates a cozy atmosphere. No technical specifications have been revealed, as Alfa Romeo has only confirmed the Tonale concept uses a plug-in hybrid powertrain. We wouldn’t be surprised if it has the same plug-in hybrid unit as the Jeep Renegade. When it goes into production, the Tonale will be one of six PHEVs Alfa plans to launch by the end of 2022. A crossover with all the passion the brand promises, but FCA reliability is a big concern.